I have touched on the subject of reigi numerous times in this blog and I am prompted to make it my topic again after a conversation that I had last week with a student who helps teach a regular beginners’ lesson. One of his colleague instructors defers to him when it comes to teaching the rules of kendo etiquette on the basis that “he likes reigi”. As he explained to me, he has no particular like or dislike of the subject, but having originally been taught by Japanese instructors and regularly nagged by me on the subject, he sees reigi as an integral part of kendo. In my view the level to which reigi is displayed in the dojo is not open to discussion. It is a fundamental expression of our regard for others and without it kendo turns into a brawl with sticks. The rules of reigi, or more correctly reigi saho (the outward expression of etiquette) are not negotiable and are either correct or not. From day one beginners should be taught how to behave in the dojo, how to bow correctly, how to treat the shinai as a sword and how and when to speak in the dojo. The latter point is best summed up by “as little as possible”. The instruction of etiquette should be delivered as a basic part of kendo teaching. The physical elements of reigi saho should be absorbed by the student from day one. If someone is capable of delivering a great men attack but cannot bow correctly, what they are producing is not kendo but a pale imitation. I regularly hear the argument that kendoists outside Japan should not have to be part of a behaviour system that was formulated in the Japanese feudal period. I believe that the answer is that kendo is above all, a vehicle for personal development and that by physically observing and perfecting its courtesies, the practitioner develops an understanding that will have a long-term effect on his or her relationships with others, both in and outside the dojo. The way you bow and stand in the dojo, the way you put on and take off your bogu and the way you thank people before and after keiko should be repeatedly polished. When these are correct and become a natural part of your behaviour they automatically improve your kendo technique and maybe make you a nicer person. I think talking about reigo needs to be done to assure everyone else keeps thinking about doing things the proper way and understand it’s importantce. Along those lines what is the proper way to leave your shinai while not in your hand? I was taught to never lean it against the wall, it should be placed on the floor with the kissaki pointing away from kamiza, but I see a lot of people leaning them against the wall either with the handle or kissaki on the floor, since they are a higer rank than me I do not say anything. Our Sempai had his last session in our dojo last night before he travels abroad for work. 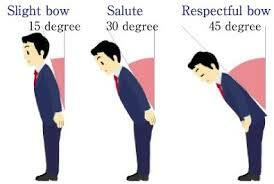 The most appropriate gesture for me was to bow to him at 45 degrees before and after Keiko. Fortunately, I found out your blog of kendo culture. By the way, my name is Young Kim, san-dan in kendo live in Seattle, WA, USA. Recently, we have discussed how to extend our Rei culture to Giri level applying into our dojo both on the floor and inside of social structure. As you known, the sense of “giri” is largely a foreign concept in American society. Also we have a tendency of misusing “senpai-kouhai” system. Some people(mostly senpai level) come to believe that this simply refers to an authority structure of the seniors ordering the juniors around. This often leads to abuse and hazing. Before and after practice, some junior member treat senior member (both rank and age) as like friend for example, calling first name only, then suddenly all the “reiho” or the idea of courtesy is gone. Of course we are not living in Japanes culture. However we believe all the real power and energy from the inside of spirit and philosophy, the idea of courtesy and respect. Sensei, do you have any article or curriculum of instruction of how to teach the concept pf rei-ni-hajinrari-rei-ni-owaru? This is an enormously difficult subject. Few people outside of Japan understand the complexities of Japanese reigi. The All Japan Kendo Federation’s Official Guide For Kendo Instruction attempts to explain the basic values, but for most of us it is a matter of observing the physical elements of reiho and treating others as you would wish to be treated.